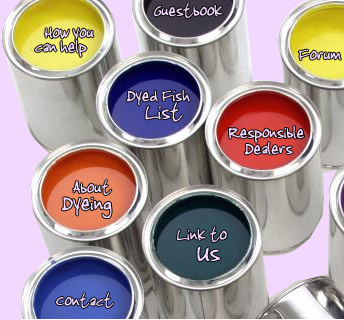 Death by Dyeing.org is an organization devoted to halting the barbaric process of injecting ornamental tropical fish with colored dyes and carcinogens. Each day, hundreds of fish of multiple species are killed by these "lethal injections". Many of those that do survive will die from their wounds or resulting disease. Only a very small percentile of dyed fish go on to live normal lives, forever branded with a sign of utmost suffering. However, we live in a world of supply and demand. We, the consumers, have the power to stop this atrocity. This is where those who really care are seperated from those who really don't. Take a minute of your life, and save a life.